Playskool is an American company that produces educational toys, dolls, and games for children. It is a subsidiary of Hasbro, Inc and was founded circa 1923. 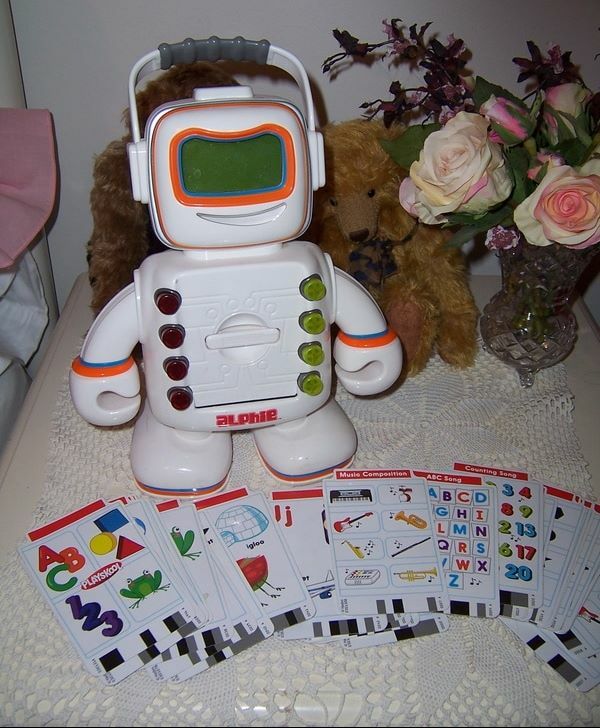 Alphie is a battery operated robot who introduces your young child to letters, maths skills, special reasoning, cause and effect and much more. (You insert an activity card into his front chest panel, and he reads it and talks to his audience. Alphie is in good working order, talks and does have some wear to the plastic as he is a preloved toy. We have two packaging Alphie booster pack cards. The booster is inserted into the cavity in front of Alphie's body. Each pack consists of 25 double sided themed cards with over 300 exercises, which are designed to improve your child's learning skills with the challenging fun cards, and a booster cartridge. "DOLLY SURPRISE - LITTLE JOGGER"
This is an extremely rare doll by Playskool called Dolly Surprise. She was produced by Playskool/Hasbro in 1987-1990. Dolly Surprises were a special doll with hair growing abilities. When her right arm is raised up her pigtails will''magically grow by over approx 7cm. When her left arm is raised up and down, the motion will wind the pigtails back into her head. There were 30 different dressed dolls produced in this line, and our doll is called ''Little Jogger''. Our doll is amazingly still wearing her original colourful tracksuit and her headband in her hair. She has lost her shoes somewhere on the jogging track! She is in working condition, however the pigtails do not pull all the way back into her head. This is a rare Playskool vintage doll with retractable hair - era Crissy Ideal doll.